Yohkoh is a solar observatory in orbit above the Earth. It uses a suite of telescopes and other detectors to observe the X-rays that are produced by the Sun. This page is a guide to Yohkoh data that are available online. Some of these data can be used "as is," without further processing. The Yohkoh Analysis Guide provides in-depth information about data analysis. There are four instrument packages on Yohkoh: the Soft X-ray Telescope (SXT), the Hard X-ray Telescope (HXT), the Wide Band Spectrometer (WBS), and the Bragg Crystal Spectrometer (BCS). A brief description of these four instruments is available. For more information about the Yohkoh mission, try the Yohkoh Public Outreach Project, and the Yohkoh/SXT Homepage. SXT: The Soft X-ray Telescope produces full- and partial-Sun images like the example at right. Web-accessible data are primarily in the form of digital whole-Sun images, at a cadence of one image per day, for dates spanning the entire Yohkoh mission. Example movies can be downloaded here, and daily SXT images(1996 -2001) can be accessed here. HXT: The Hard X-ray Telescope images solar flares in hard X-rays. HXT images are often used in conjunction with partial-Sun SXT images, as in the image at right. HXT images are not currently available on-line. Flare light curves in hard X-rays are readily prepared from HXT data. Click here for a light curve of the flare in the image at right. 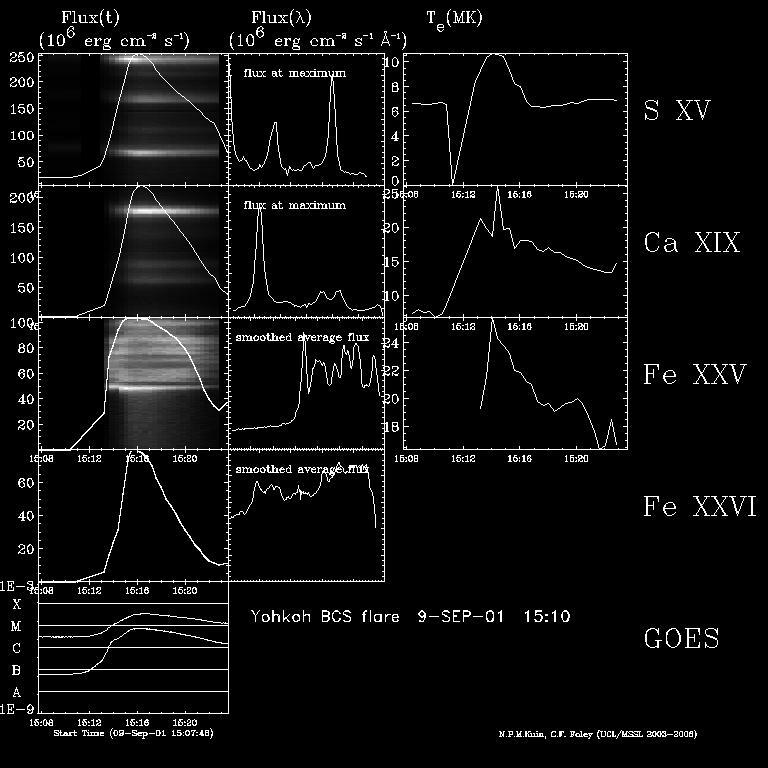 HXT flare light curves are published in The Yohkoh HXT Databook, by the National Astronomical Observatory of Japan. A catalogue of flare events observed by HXT is available in here. WBS: The Wide Band Spectrometer comprises a set of three non-imaging detectors that measure soft X-rays, hard X-rays, and gamma rays. The output from WBS is a set of simultaneous time-resolved spectra. Example data from WBS appear at right. WBS light curves and spectra can be readily prepared from the raw data. A catalogue of gamma-ray flare events observed by WBS(HXS/GRS) is available in here. BCS: The Bragg Crystal Spectrometer is a high-resolution spectrometer for X-rays. It views the whole Sun with four bent germanium crystals, observing the 10 to 50 million K plasma created in solar flares. A catalogue of flare events observed by BCS is available in here.